Dr. WEi Zhang who was a postdoc in Sidhu and Moffat labs has started in July his own research group at the University of Guelph. During his time as a postdoc in the labs of Professors Sachdev Sidhu and Jason Moffat in the Donnelly Centre, Wei Zhang helped develop a technology for engineering new protein-based drug candidates and research reagents, landing awards and publications in prestigious scientific journals. He won a CIHR Postdoctoral Fellowship, the Mitacs Award for Outstanding Innovation and a Cancer Research Society/BMO Bank of Montreal Scholarship for the Next Generation of Scientists, which provides winners with $120,000 in research funding once they have secured a faculty position at a Canadian university. 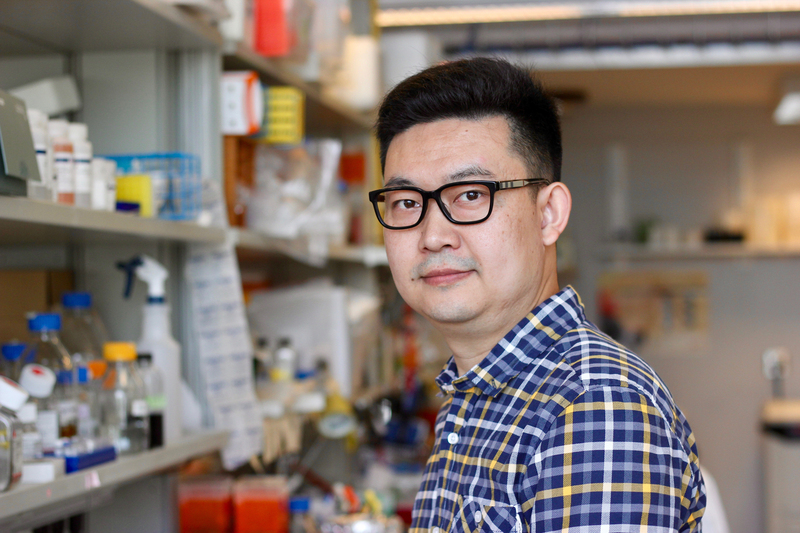 Before coming to the Donnelly Centre, Wei received his PhD from U of T’s Department of Molecular Genetics under the supervision of Professor Daniel Durocher at Sinai Health’s Lunenfeld-Tanenbaum Research Institute. In July 2018, Wei started his own research group as Assistant Professor in the Department of Molecular and Cellular Biology at the University of Guelph. Here, Wei shares his experience of being on the job market and advice on what it takes to get an academic position in Canada. Was the Cancer Research Society award helpful to you when you were looking for jobs? The CRS award definitely helped. I had a couple of solid papers but I did not have the flashy papers in top tier journals such as Nature, Cell, or Science, so I think the award really helped me get the foot in the door and be invited for interviews. Once I got the interviews, everything was back to zero. I don’t think the award gave me that much advantage in interviews. But with $120K, the award also gives me extra money, in addition to the startup money provided by the University of Guelph, to hire people and buy equipment. So that also helps. My family is in Canada and we wanted to stay here so I mainly applied to Canadian universities. Also, the CRS award was only applicable in Canada. I applied to seven universities in Canada, interviewed at three and got offers from two. I think job candidates should apply to as many places as possible. I applied to everything that was available but this year there were not that many positions available for which my research was a good fit. The number of available positions changes year on year, they come in waves. All three interviews were so different! At one university, I did a two day visit where on the first day I gave a one-hour seminar and had one-on-one meetings with the department Chair and faculty. You end up meeting about 15 faculty in two days, it’s a lot. On the second day I had a formal interview with search committee members who grilled me for two hours! It was very intense, they asked many questions and not just about the science. For example, they wanted to know how I would resolve conflict in the lab or what would I do if I caught a student cheating in the exam or if they fabricated data in the lab. My interview in the other place was totally different. They invited all job candidates, seven of us, for a symposium, so we got to mingle and hear each other’s talks. And each of us had one-on-one meetings with at least 12 PIs in the institute. And in the third place, the interview was conducted via a video conference with all search committee members. That was the first round. If you pass, they then invite you in person for the second round. The main message is: everywhere is different. You have to be prepared for that. Every opportunity is a real opportunity. You cannot say ‘this interview I’ll prepare well for and the other one I’ll pass’. You have to prepare for every kind of interview and “all in” every time. How did you prepare for the interviews? I talked to lots of senior people, my mentors and friends who became PIs recently. Also try to find out as much as you can about each university. See if you already know people there and go and visit ahead of time. I also practiced my research talk and interviews with my lab members here in the Donnelly. I even did a mock interview with my wife who works in the industry in which questions about workplace relationships are common so she helped me prepare for that. In academia we usually focus on the science and don’t expect behavioural questions about interpersonal relationships such as conflict resolution. Remember that you have to give a good answer right away and you don’t have time to think. What advice would you give to others who are looking for PI positions in Canada? Have a good research program, that’s the most important but also look for awards, like the CRS, although there are not many of them per year. In your proposal, highlight its uniqueness. Let people be convinced that you will create a niche area, that only you can do the proposed research and no one else. The connections are important not only when you apply for your position but also after. In Canada, biomedical research is a small circle, everybody sort of knows each other, this is especially true in your own field. You want your grants to be reviewed by people who know your work and understand it. They can criticize it and mark it down if they don’t like it, that’s fine as long as you get constructive feedbacks, but it would be a lot worse if they had never heard of you. I would suggest junior researchers should make an effort to go to domestic conferences and meet colleagues from other parts of the country. For me it was probably a little easier because I did all my training here so over time I got to meet many PIs and some of my friends went on to become PIs. But it’s also important to build international connections. With Dev, who is very collaborative, I had the chance to build many collaborations and I was then able to highlight that in interviews. And some of those I hope to maintain through research in my own lab. I feel very fortunate to have an opportunity to start my own research lab. I could not have done this without help from friends, colleagues, and collaborators. I greatly appreciate support and advice from my mentors Drs. Durocher, Moffat, and Sidhu. I also want to thank my collaborators Drs. Daniela Rotin and Brenda Schulman for writing (many) recommendation letters. Last but not the least, our lab neighbor Dr. Mikko Taipale knows everything!